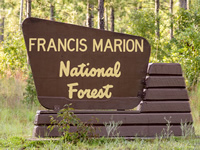 In 2012 the US Forest Service began the task of revising the management plan for the Francis Marion National Forest. The resulting plan will direct the management of critical ecosystems for the next 10 to 15 years. In 2012 the US Forest Service began the task of revising the management plan for the Francis Marion National Forest. The resulting plan will direct the management of critical ecosystems for the next 10 to 15 years. Over the past year the Forest Service has been conducting extensive surveys of existing conditions on the Forest, including species of conservation concern, hydrology and wetland ecosystems. Other significant issues being addressed in the current planning process include prescribed burning in an increasingly urban environment, climate change, longleaf pine ecosystem restoration, and invasive species. Unlike our wildlife refuges, which are managed first and foremost for the benefit of wildlife, the forest is managed for a variety of uses, including watershed protection and improvement, habitat for wildlife (including threatened and endangered species), wilderness areas, timber production, education and recreation. It is not an easy task to find a balance among all these uses. The Forest Service needs to hear from you. This is an opportunity to support our local biologists and managers in their efforts to protect and enhance critical watersheds and longleaf pine ecosystems for all the species that depend on these habitats, and for the surrounding communities that benefit from them. Review and comment on the draft plan on the Forest service planning website. Participate and encourage others to do the same! Decisions as to how the resources of the Francis Marion National Forest will be conserved are guided by a comprehensive management plan. The current management plan was written in 1996 and focused mainly on post Hurricane Hugo recovery. Since that time forest managers have been faced with many new challenges. There is a lot at stake in this process. In addition to being critical to longleaf pine restoration efforts in the Southeast our 259,000 acre Forest is home to nearly 300 species of migratory and non-migratory birds and has been designated as an Important Birding Area by both National Audubon Society and the American Bird Conservancy. Species found on the Forest include the state endangered swallow-tailed kite, and the federally endangered red-cockaded woodpecker and wood stork. More than 1,600 species of plants have been documented on the Forest, including 32 species of orchids and 12 carnivorous species like the trumpet pitcher plant. Twenty-five of South Carolina’s last remaining 200 Carolina Bays can be found on the Forest. Dozens of species of reptiles and amphibians call the Forest’s 153,000 acres of wetlands and streams home. On top of all this add the incredible recreational opportunities the Forest provides, four wilderness areas, rich Revolutionary and Civil War history, and cultural treasures like a 4,000-year-old shell ring near the salt marsh that remains as a monument to Native American culture, and you have a resource which adds tremendous value to our community on countless levels, and is worth protecting for generations to come. The Forest’s current biodiversity is the result of a landscape recovering from the alterations of rice plantations, intense logging of the late 1800s, the building of roads, and in 1989 Hurricane Hugo, which leveled a third of the Forest. Ensuring the continued recovery and future health of a landscape that has seen so much devastation will require careful planning.